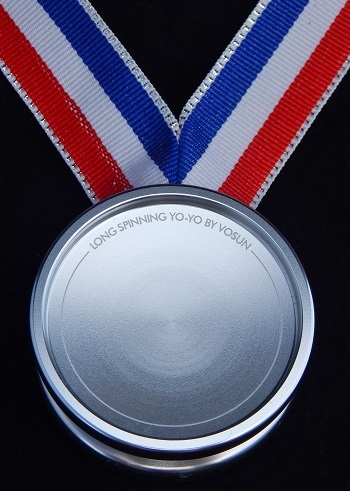 The Vosun "Long Spinning Yo-Yo" medal came in gold, silver, and bronze anodizings. These fully-functional yo-yos were originally intended to serve as player awards at contests. The flat, unsculpted face made it easier to have them custom laser engraved on one or both halves. For example, you could have the name of the winner engraved on it, along with the name of the contest and division, location, date, and so on. As a slimline, aluminum responsive yo-yo, they first appeared in North America May 20, 2017 at the Eastern Canadian Regionals Yo-Yo contest in Toronto, Ontario. Vosun was a gold-level sponsor of the event. The YoYo Medal next appeared June 24, 2017 at the Krakow Yo-Yo Battle at the Pauza In Garden, Poland. Following these two contests, there was apparently enough user demand expressed to sell the yo-yo by itself that Vosun allowed a limited quantity of them to be sold through a Canadian yo-yo vendor. 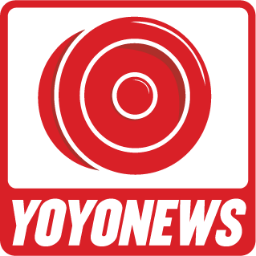 Whether this yo-yo will eventually receive a full-scale release and be sold by more than one online yo-yo retailer remains to be seen in 2017. It is unknown whether these throws originally came with a half spec size C bearing or a full spec size C bearing. The Eastern Canadian Regional winner is shown in a video using the yo-yo with a half-spec bearing. However, the Canadian vendor that was selling these shipped them with a full spec size C bearing; you could optionally buy a half spec size C bearing to go with the yo-yo. Came in a sturdy black box, with one black string, and a full spec size C bearing already installed. The neck ribbon in the picture was not included with the yo-yo; it was purchased separately and added to the yo-yo for visual effect. Original retail price: $33 US.